Many archery deer hunters (myself included) have learned the importance of cutting shooting lanes the hard way. For me, it was just last season. I had done all the preseason preparation necessary for a successful season. I sighted in my bow, practiced regularly, setup and used my trail cameras to gather information, and cleaned and removed the scent from my clothing. All that was left was to get out there and put my time in the woods…or so I thought. On the morning of the third Saturday of archery season I had eleven does come over the hill. They had surrounded me and nearly all of them were within 15 yards of the base of my tree. The last deer to crest the hill was a giant eight point that I had seen only once in trail cam photos. He was the largest buck I had photographed in the preseason and I was more than a little excited at the prospect of downing this 130 class eight. My trophy buck was closing in on bow range and I had already picked out my shot location and positioned my body patiently waiting for a moment to draw. With all the does and a button buck distracted by the behemoth approaching I took the opportunity to draw. 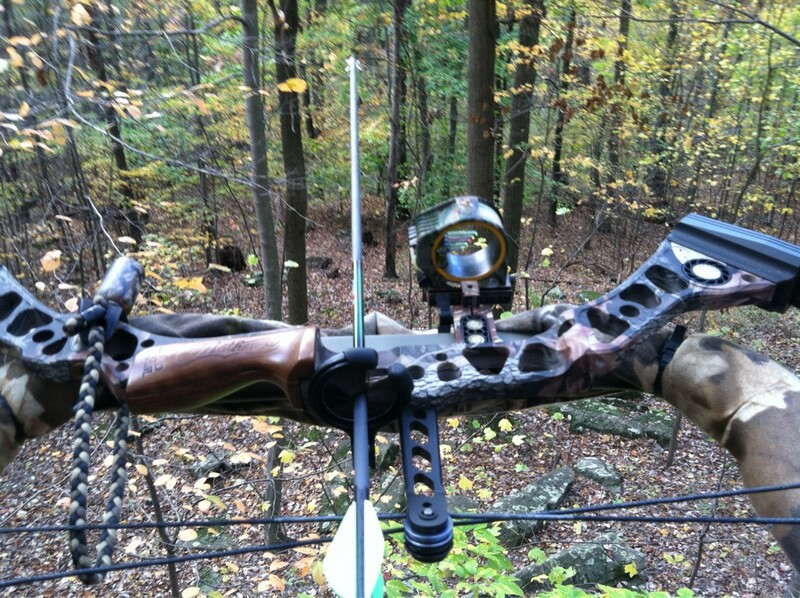 My target was 25 yards away standing behind a giant oak tree which concealed my movement from his vision. Just two more steps and he would be mine. The buck responded as if I had scripted his movements myself. He took his two steps into the opening, I grunted, he paused, and I cut my arrow loose. In that moment while the arrow was in flight but before contact with my targeted buck I felt pure jubilation. Surely I could not miss a broadside shot at 25 yards in relative openness. Alas, I heard my arrow crash into the leaves and watched in disbelief as all the deer including my trophy buck ran away to safety. Befuddled, I left my treestand to investigate. I found no blood, no hair, only an arrow with expanded broadhead trapped in the mud beneath a rotting log. How could this have happened, I wondered? After looking at the shot from multiple angles I finally stood at where the deer had been standing and looked back and up toward my treestand. Instantly I noticed the tip of a very small branch that was slightly broken and hanging from the branch nearly severed completely. My heart sunk as I realized that my trophy had escaped due to my lack of preparation. During the preseason I neglected the tedious duty of cutting my shooting lanes because I thought that I could “shoot around” any new growth. However, the new growth had stymied my arrow and cost me the perfect ending to my hunt. Worst of all I didn’t see that buck the rest of the season. 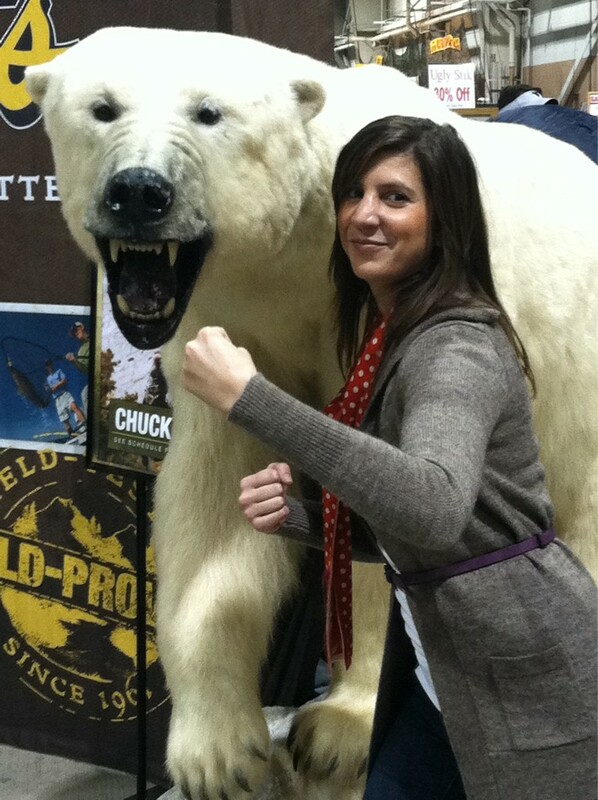 Sara battles a Polar Bear at the 2012 Eastern Sports & Outdoors Show. Our money is on Sara. This year (fractured femur and all) I was in the woods cutting my shooting lanes. I guess I cannot really say that “I” was cutting shooting lanes. Due to my hobbled state (ankle to hip knee brace, cane, etc..) I needed to call in reinforcements. My lovely wife Sara (She is a nightlife columnist. Check out her blog HERE) who enjoys being outdoors but repeatedly reminds me that she does not want to “meet the deer before she eats the deer” is obviously not an avid hunter but she understands how important it is to me and sympathized with my situation enough to join me on Saturday afternoon to cut shooting lanes at my treestand. I managed to climb into the stand as Sara worked her way around my tree trimming limb after limb at my behest. (Sara has officially earned my nomination for ‘wife of the year’) With a little help from Sara and a hard lesson learned from last season, I am finally ready for opening day. The moral of the story is do the work if you want to be successful. Don’t shirk our duties because it will cost you in the end and if you havent cut your shooting lanes yet this season, then do so immediately. Lucky for me, my bruiser made it through the winter and has made several appearances on my 2012 trail cam photos giving me much to be excited about for 2012. As always if you have any questions email us at teamsurra@gmail.com. Dont forget to “like” us on Facebook and follow us on twitter @SurraOutdoors. Happy Hunting! Thanks for the comment. Writing and maintaining a blog does take a lot of work, howevever, the challenge we find most difficult is managing the time it takes to create and publish posts. Content creation is vital to a successful blog. If you are writing in a diary every day then you have already done half of the work. WordPress allows you to schedule times of publication. This function enables you to create a blogpost in your free time and post it in the future automatically when you see fit. That is how we operate our blog without infringing on the time/resources of our day jobs. Our tip – Create your content and schedule your publications in advance. Good Luck on your blog.